Obituary* 13 Sep 2008� PINE BLUFF - Martha Culpepper Weatherford Weeks died Sept. 11, 2008. Born in 1917 to the late John M. and Mary Phelps Culpepper of Palmyra (Lincoln County). She was predeceased by her first husband, James B. Weatherford; a son, James W. Weatherford; her second husband, Charles E. (Eddie) Weeks; her brother, James M. Culpepper; a sister, Rebecca P. Gardinier. Survivors include daughter, Martha Dianne Cumnock and son-in-law, Ben Cumnock; daughter, Rebecca W. Schumacher; son, John R. Weatherford and daughter-in-law, Andrea Worm Weatherford; three grandchildren and two great-grandchildren. Martha was a long-time resident and grocer in Pine Bluff; Salvation Army Volunteer and a member of Hawley Methodist Church. Burial service will be private. Memorials may be made to your favorite charity. Arrangements are by Roller-McNutt Funeral Home of Conway. Vital Records Division of the Arkansas Department of Health, compiler, Arkansas Marriage Index, 1933-1939, Online database at Ancestry.com, 2005. Mattie Culpepper, Female, and James B Weatherford married 16 Dec 1936 in Jefferson Co., AR, Volume 0002, Certificate 13724. Obituary of Martha Culpepper Weatherford Weeks, published in an unidentified newspaper. Mineral Co. MT Death Records, Rootsweb, as found by Pat Roberts. Naome Brambaugh, Boarder, F, age UN, OK US US, Teacher-Pub School. Trent H. Culpepper, Head, M, 41, M, md@24, AR AR AT, Texas Oil Co.
Geo M. Culpepper, Bro, M, 33, M, md@24, TN TN TN, Working on Farm. Walter Vannoy Culpepper, Male, Widowed, died 28 Nov 1965 in Brazos Co., TX. Biography* � Dr. VanNoy was one of three graduate physicians in the Indian Territory for a number of years. He was the son of William and Catherine VanNoy. Dr. William VanNoy and his wife Catherine Calvin VanNoy came from Oxford, Miss with several children. The oldest was Serepta S. VanNoy, born in 1830 I believe. There were several boys, Thomas J (Civil War and a physician also), Calvin C. (My great grandfather, who was an attorney and a later a minister in the Presbyterian Church in Tishomingo), John (also a physician and Civil War), a Henry Foster ( a pharmacist, I believe, who later moved to Kansas or Missouri and was murdered in his own store in a robbery), a Harace or Horace (a one-time representative in the Texas Legislature), and there were more children later. 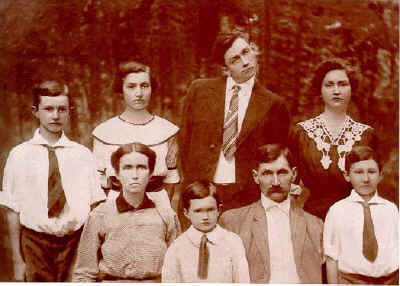 I think that Walter Winfield was the youngest of that family. north east part of Texas; one in Mount Pleasant, one in Daingerfield. Dr. Thomas J. was discharged as a Captain. At some time the family moved to Fannin County, and lived in the little towns of Honey Grove and Dodd City, and well as Bonham. Some of the brothers started the First National Bank in Dodd City (no longer there, of course), one owned a store I believe, and Dr. William (original pioneer), Dr. Walter, and Dr. Thomas all were physicians in the area at one time. Dr. John was injured in the civil war with a gun shot to the face and lived through it. My husband and I went to Dodd City (about 6 miles east of Bonham) and found a cemetery with 14 VanNoy graves in it. From the library I found there is a private cemetery on some property with the graves of Dr. William and his wife _______ Cobb (second wife?--probably so). And thanks to the town folk who were in the city hall, I found a distant cousin, a granddaughter of Dr. John) who was still alive. We exchanged correspondence (she wrote beautifully, but cannot hear well, so I have never met her, and she does not like to talk on the phone). Her name is Dorothy VanNoy Johnson. About Serepta, she told me that Serepta had a great love who died in the Civil War, and that she never married. She stayed and took care of family. She was described as the proverbial "belle of the ball", and I am sure she was a very lovely lady. There is also a town in Mississippi named Serepta. Mrs. Johnson also told me the town was named for Serepta VanNoy because she was the first child born in that settlement area of Mississippi; a part of the local custom. I had never found Walter Winfield's grave, and I suppose he and family are buried in Keifer, OK.
Ethel Clyde Woodall Grider, McGehee Descendants, Winder, GA: E.C.W. Grider. E-mail written 2000 to Lew Griffin from Margaret A. Davis, e-mail address. Walter V N Culpepper, White, Married, born 1914 in Oklahoma, residing in San Francisco Co., California, enlisted as a Private in the US Army on 14 Mar 1941 in California. Jennie Mildred Culpepper, Female, Single, died 3 Apr 1965 in Brazos Co., TX. 13 Apr 1965, p. 10B, col. 3. Susan Culpepper, Female, born __ 1948 in Hidalgo Co., Texas, child of Walter Van Noy Culpepper and Jennie Mildred McRae. Van Noy Culpepper, Male, born __ 1949 in Hidalgo Co., Texas, child of Walter Van Noy Culpepper and Jennie Mildred McRae. Joel Fuller Culpepper, Male, born __ 1951 in Hidalgo Co., Texas, child of Walter Vannoy Culpepper and Jennie Mildred McRae. Duncan McRae Culpepper, Male, born __ 1953 in Hidalgo Co., Texas, child of Walter Vannoy Culpepper and Jennie Mildred McRae. Malcolm Culpepper, Male, born __ 1954 in Hidalgo Co., Texas, child of Walter Van Noy Culpepper and Jennie Mildred McRae. Idaho Marriages: Effie Elizabeth Culpepper and John Elmer Breen married 26 Oct 1910 in Wallace, Shoshone Co. ID, Vol. 5, p. 283. "Died Sunday morning, at Trinity Village Medical Center. Born to the late LeRoy and Mabel Higgins Culpepper in Faith, Arkansas. Mr. Culpepper is survived by one daughter, Marlene Culpepper-Venus of Jacksonville, Arkansas; one sister, Maggie Mae Greenleaf of Red Bluff, California; five (5) grandchildren and eight (8) great-grandchildren. He was preceded in death by one son, James Gordon Jr. and one grandson, Charles Fredrick." Find A Grave Memorial# 14807685. Janis Culpepper, Wife, F, 20, md@20, AR/AR/AR, Not employed. Obituary of Kenneth Wayne Culpepper Sr. (#4345), published Sunday, March 21, 2010 - Page 7B. "Janis Stone Culpepper, of Dumas, died at Trinity Village Medical Center. She was a daughter of E.H. & Bessie Blythe Stone. She graduated from Watson Chapel High School in 1927. She was a member of First Baptist Church of Dumas, and Watson Chapel Baptist Church. She was preceded in death by her husband, Robert Lee Culpepper, who died in 1963. Surviving are 3 sons, Edgar L. Culpepper of Dumas, Robert C. Culpepper of Little Rock and Kenneth W. Culpepper of Hot Springs Village. She was sister to H.M. and A.G. Stone, both of Pine Bluff; a sister, Valerie Rodgers of West Monroe, Louisana. She had seven grandchildren. Graveside services held at 10:00 a.m. Saturday, March 24 in Memorial Park Cemetery with Brother M.L. Faler officiating. Arrangements were by Ralph Robinson & Son Mortuary." Find A Grave Memorial# 5346485. Obituary* 21 Mar 2010� Kenneth Wayne Culpepper Sr., age 71, went to be with his Lord and Savior, Jesus, and the loved ones who had gone before him on Thursday, March 18. He was born on Jan. 23, 1939, in Pine Bluff, Ark., the son of Robert and Janis Culpepper. He was a retired pharmacist that previously worked at Petty's Drugs and USA Drugs in Little Rock and Benton. He was a faithful member of the Sacred Heart of Jesus Catholic Church in Hot Springs Village. He is survived by his wife of 46 years, Florence Jean Culpepper: his daughter, Tamara Ringler, his two sons, Kenneth W. Culpepper Jr. and Robert Lee Culpepper. His seven grandchildren, Billy Holland III, J.T. Gingerich, and Blake Gingerich; Julia Culpepper and Scarlett Culpepper, Liam Baker and Ceciliah Culpepper. His two brothers: Edgar Culpepper of Dumas and Dr. Robert Culpepper of Little Rock. Visitation will be Monday, March 22 from 6-7 at the Griffin Leggett Forest Hills Funeral Home, 10200 Hwy 5 North, Alexander, Ark. A Rosary will be held at 7 p.m.
Graveside funeral services will be Tuesday, March 23 at 1:30 p.m. at the Griffin Leggett Forest Hills Memorial Park with Deacon John Marschewski officiating. E-mail written 1999 to Lew Griffin from unknown author, e-mail address. From QRZ.com: Amateur Radio License KB5EER Oren R. Culpepper, Malvern, AR. Oren served in the US Army from 1958 to 1977 as an Infantry officer. Tours of duty included Germany, Korea and two tours in Vietnam.